Guys spend on dress shirts and suits to look smart, while girls spend it on shirts that are not neccessarily the most practical things in the world, but are definitely the prettiest. I adore these two from Chloe. 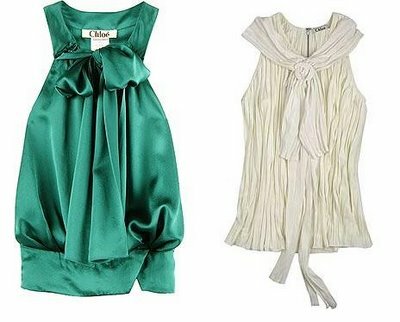 The white pleated one is great for the day time, but I especially adore the silk one, which looks so classy. They have it in many other colors too and they ALL look fab I hard a hard time just choosing one! Vanessa Bruno also makes gorgeous pretty tops. The light blue one with the pretty butterfly sleeves is perfect for a casual day out and the vibrant electric blue one on the left is a Harrods Girl favourite. 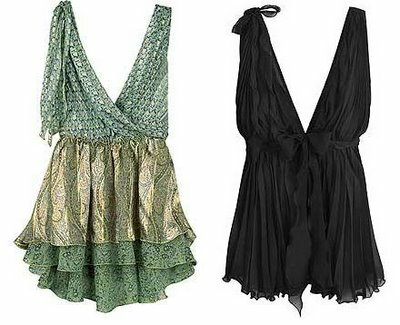 For oodles of details, frills and layers, there are these two Grecian top from Anna Sui and Emilio Pucci, which is both elegant and fun. And these two black and white ones from Paul & Joe and Marc by MJ. Although I must say, this Marc by MJ one does not work for everyone. A little simpler but just as beautiful, there are these two from Bellekat and Development. For something a little edgier, these two from Zac Posen and Sass & Bide are just the thing. Pretty things are imminently impossibly delicate as well. 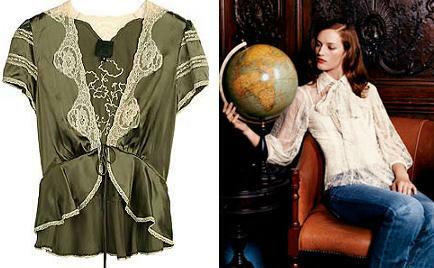 These two from Anna Sui and Robert Rodriguez are a perfect example of that. Oh and they are almost always amazingly expensive too for something with so little fabric. But they are all just oh-so-gorgeous! Just wonderring, are they still selling the sass&bide top you are referring to? I LOVE the grecian tops, and the Sass & Bide top is something I def can picture myself wearing! Anon 9:52: Like Sophia said seamless camis even only in black are ideal for under really revealing tops. I personally live in NZ where it can get pretty cold, so I just wear a long sleeved t-shirt or a turtleneck underneath a revealing top. I also sometimes wear a really inexpensive white t-shirt underneath a top like that so that it doesn't look too bad. I want that green chloe one. right now. So true, so true. We should be spending our money on other more important things, but with tops like those who can resist? I´d really KILL for the black PUCCI one! No, I´m NOT joking! I took the liberty to check how much your blog is worth, and according to http://www.business-opportunities.biz/projects/how-much-is-your-blog-worth/, it's worth $234,284.10. My blog is $0, haha. The Chloé ones are perfect. I love the simpler ones.. nice blog. I love Sass & Bide tops...they are so funky!!!! I think most of those tops could be worn without anything underneath - or like others have suggested - with a cami or something. They ALL look like lingerie not something to be worn in public. No thanks. Anna Sui and Paul & Joe are my two favorites! Please check out my blog, and maybe link me back? USA Brands Clothing, collection of designer clothes for young and old. Satisfaction guaranteed. Principalfashion is an excellent online clothing store providing discounted prices of both men and women designer wear. We have the best prices for fashion designer products. I love the Anna Sui and Robert Rodriguez shirts. They have a Victorian feel that I like very much.